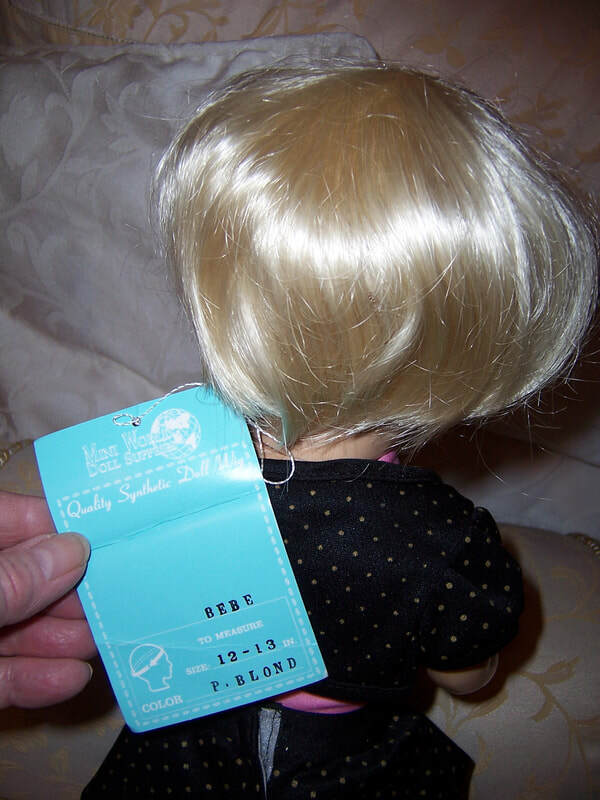 HOW TO GET THE PERFECT WIG FIT FOR YOUR DOLL. Using a string, stRip of paper or a measuring tape, wrap around the crown of the doll above the ears and around the forehead. Mark the string, then lay it flat and mEasure it ( in inches) with a ruler. Select your wig size accordingly. Example a 12" circumference equals a size 12 wig. aLL THE WIGS ON OUR DOLL ARE NOT OVER AN EXISTING WIG BUT A BALD HEAD. DOES YOUR DOLL NEED A NEW LOOK? 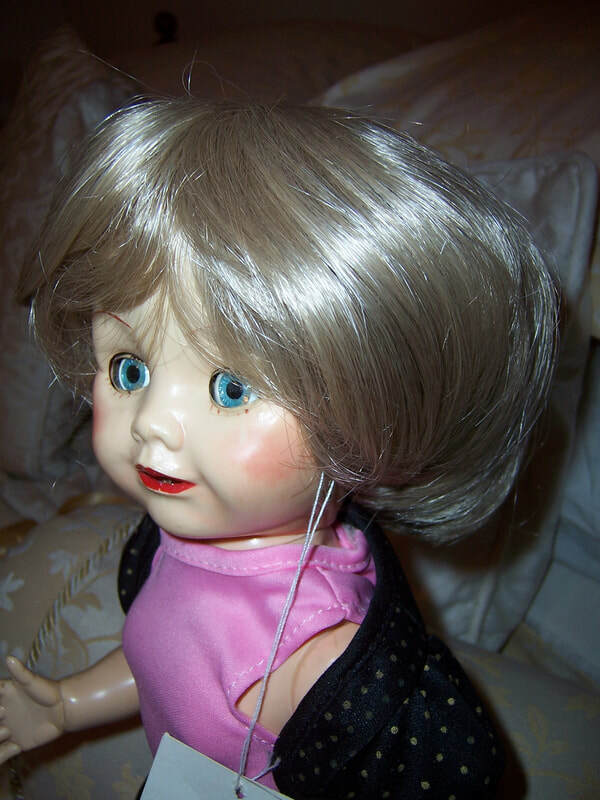 This is a short wig and modelled on my 16'' Pedigree doll. ​It is a little unusual due to the fact it only has a small pate to glue onto the top of the head. It does have a good cover of hair as you can see from the pictures. ​ At the moment it does not have a fringe but once glued on you could cut a fringe if desired. It is brand new, and is off old stock. It comes with its original hairnet but no original box or plastic bag. This wig is new and has not been used, but is of old stock. It has its original hang tag and hairnet, but does not come in a box. It is very pretty and looks lovely on our 16" Pedigree doll model. This wig is soft to touch, hair is shiny. This wig is new and has not been used, but is of old stock. It has its original hair net andno original plastic bag/box. It is a little big on her but once it is glued on it should be fine. At the moment it does not have a fringe but you could cut one to suit her once the wig is in place on her head. This wig is new and has not been used, but is of old stock. It doesn't actually have a hangtag to tell me its brand, size or colour either. This wig is soft to touch, hair is shiny and is a short pageboy style. 5. Brand: Kemper modacrylic wig fibre - new but of old stock with original tag. Long crimped hair with fringe at the front. 6. Brand: Tallinas Doll Supply - old stock but new with original hairnet and packing. Two long sausage curl pigtails with fringe at front. 8. Brands:Imsco World of Dolls - new but of old stock with original packaging and hairnet. Tight little curls at front of forehead, and long sausage curls down the back.